Or maybe I should have titled this post, “How to Caramelize Onions and Why You Don’t Usually Have To.” Because nine times out of ten, when you want your onions soft and sweet, you can just cook ’em like crazy over high heat and end up with a sweet, jammy mess that will do the trick nicely. There, I just saved you hours of standing over a hot stove. Now you have time to read a good book. You’re welcome. But, ok, sometimes you want the real thing. You want a more refined result, a whisper-soft bowl of yielding allium nectar. Caramelizing onions is transformative, like grilling broccoli or roasting cauliflower or shaving raw brussels sprouts for a salad. And once you make your first batch and see how little hands-on time it takes, there will be nothing to stop you from making the occasional batch to add to eggs and soups and fancy little toasts and all manner of things. 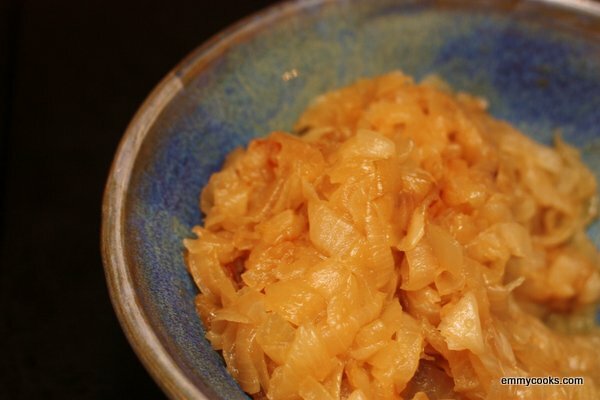 This entry was posted in DIY, Food, Recipes, Sauces, Snacks and Apps, Vegan or Would-Be-Just-As-Good-Vegan, Vegetables By Themselves and tagged caramelized onions, cooking tips on September 20, 2012 by emmycooks.